Charles (Kid) McCoy was a clever and popular fighter at the turn of the century. He is credited with inventing the corkscrew punch, which was thrown while rotating the fist. It is also believed that the term, "The Real McCoy" evolved into the usage of the English language because of him. To gain a psychological advantage over his opponents, McCoy feigned illness before several bouts or he would spread the word to the media that he neglected training. On fight night, much to the surprise of the press and his opponents, McCoy was usually fit and ready to fight. Thus, reporters often asked, "Is this the real McCoy?" In 1896, McCoy knocked out welterweight champion Tommy Ryan won by disqualification over former welterweight champion Mysterious Billy Smith. 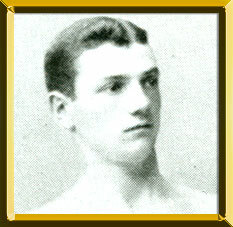 In 1897, McCoy won the middleweight title vacated by Bob Fitzsimmons when he knocked out Dan Creedon in the 15th round. McCoy often fought heavyweights and beat such notables as Joe Choynski and Peter Maher. But in 1900 he was knocked out in five rounds by James J. Corbett, the former heavyweight king. Then, in 1903, he challenged for the light heavyweight title but lost to champion Jack Root. After leaving the ring, McCoy tried acting but didn't find the same success. He then began dating Theresa Mors, a wealthy antique dealer who happened to be married. Mors fell for McCoy and began divorce proceedings. As the proceedings dragged on, Theresa Mors was shot and killed in the apartment she shared with McCoy on August 12, 1924. McCoy was charged with the murder and was found guilty of manslaughter and sentenced to 10 years in prison. In 1940, three years after he was released from jail, McCoy took an overdose of sleeping pills and died.